How to shop Zara like French women is something we ask more often than you might imagine. Why? Well, the French are notoriously a little bit more discerning when it comes to the high street, but, of the chic Parisian women we know, they are all still partial to un petit peu of Zara. Ergo, if they deem it of a quality good enough for their concise capsule wardrobes, then there must be a very French way to sift the wheat from chaff and zone in on the most sophisticated things our favourite shop has to over—without getting distracted by impulsive buy-buy-buy urges on the way. 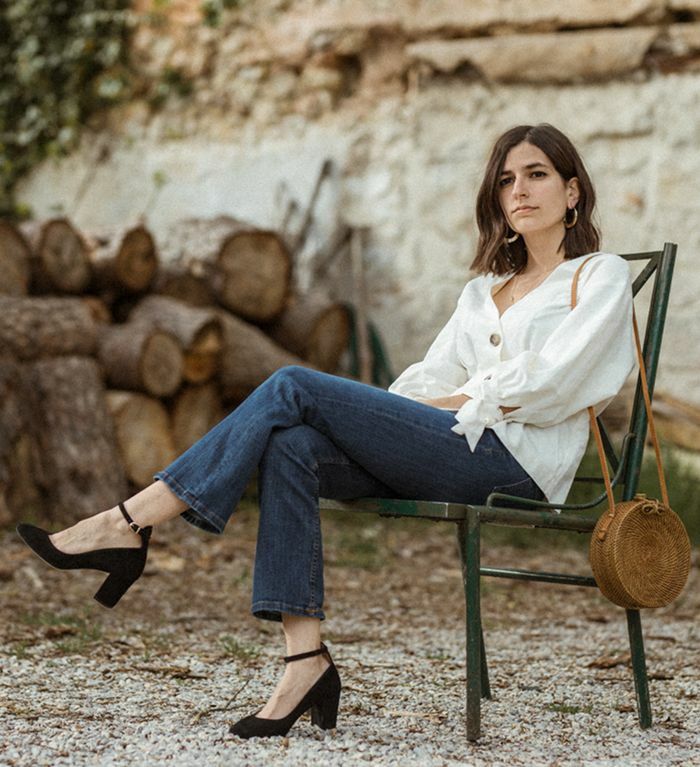 Parisian women always look for items with longevity and seek out classics, so we grilled our favourite French blogger, Aria Di Bari, because she not only specialises in uncovering the most deluxe pieces on the high street, but she's a Zara advocate on her site—often cherry-picking the must-haves before they've become so. Read on to get her top tips for how to shop at Zara like a French girl, and you can pick up a few of our key buys, too. "The one thing I always buy from Zara is shoes. Zara shoes are always the prettiest! I mostly buy leather boots and heels, and sometimes I borrow sandals from my mum." "The only thing I don't like about their shoes is that they can be really uncomfortable when they are brand-new. The leather is usually quite stiff despite the good quality of it, so I usually break in the shoes at home before I wear them outside." "There are things I wouldn't order online, like shoes; I would rather try them on in-store. But when I go to my local Zara, I'm there to buy anything that really catches my eye." "As well as shoes, I would always buy the blazers as they are very well tailored." "I would recommend to buy at Zara Woman and not Trafaluc. It's a little bit more expensive, but the fabric is usually nicer and the clothes are well-fitted and last longer in my opinion." "When I shop online, I usually want to buy a very specific piece. It's usually one of these on-trend items that would fit my style or a basic I don't have yet (like blazer or a pair of tailored trousers, for example). Sometimes, it's just a piece I saw a friend or another blogger wearing that I would want to try myself!" "I think the jeans don't fit very well and the denim gets really lose after a few hours of wearing them—but the trousers are usually well fitted. Also, I won't buy their linen T-shirts anymore [because] they don't last very long." "When I shop, I'm usually very picky about the fabric first, but I studied fashion so it's easier for me to spot clothes made of quality material. I also look at the mannequins, as Zara usually puts all of its nicest clothes on them." "I've never sent anything I bought online back; I know how the sizing works at Zara and I've never had bad surprises so far—so keep trying items on to work it out if you haven't already." "I usually don't tailor anything I buy from Zara. If I have to tailor anything, it usually means that it doesn't fit to my body shape and I don't buy it." "I do own one piece from Zara from a long time ago that I just can't get rid of: a beautiful black waistcoat with silver embroidery and beads that I bought at least eight years ago. At the moment, they have some great embroidered and printed pieces." "Sometimes I will belt a dress or a long blazer to mark my waist, but this just depends on my mood or the design itself." Next up, our spring 2019 trend report.